Available spring, 2016, University of New Mexico Press. 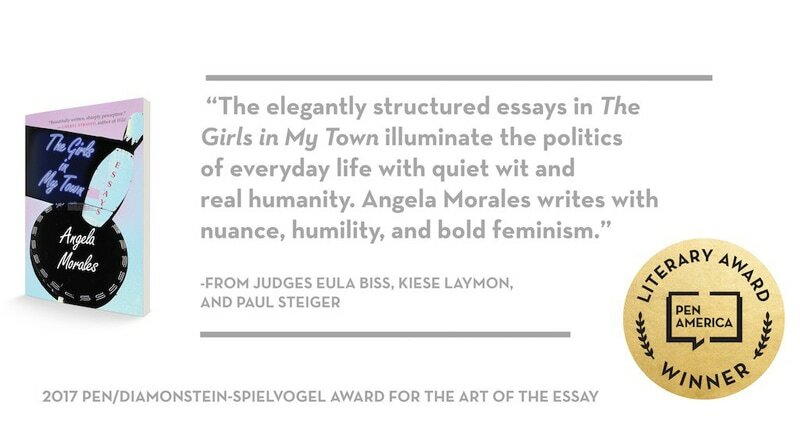 "The autobiographical essays in The Girls in My Town create an unforgettable portrait of a family in Los Angeles. Reaching back to her grandmother's childhood and navigating through her own girlhood and on to the present, Angela Morales contemplates moments of loss and longing, truth and beauty, motherhood and daughterhood. She writes about her parents' appliance store and how she escaped from it, the bowling alley that provided refuge, and the strange and beautiful things she sees while riding her bike in the early mornings. She remembers fighting for equal rights for girls as a sixth grader, calling the cops when her parents fought, and listening with her mother to Helen Reddy's 'I Am Woman,' The soundtrack of her parents' divorce. Poignant, serious, and funny, Morales' book is both a coming-of-age story and an exploration of how a writer discovers her voice." "Riding in the Dark." River Teeth, Summer, 2011. "Nine Days of Ruth." Arts and Letters, 2011. "Ode and Apology to Dogs I've Loved." The Los Angeles Review, 2011 and The Low Valley Review, 2015. "Chief Little Feather, Where are You?" Southern Review, Autumn 2011. "Gunslinging." The Baltimore Review, 2012. "The Burrito: A Brief History." Hobart Online. May 2014. "18 Meditations from Denali." NPS Denali. 2015. "Ode to a Red Rabbit." The Pinch, 2016. "Nature Camp for Disadvantaged Youth, circa 1978." Indianola Review, 2016. "The Girls in My Town." California Prose Directory: New Writing From the Golden State, 2013. Outpost 19 press. "The Girls in My Town." Best American Essays, 2013, ed. by Cheryl Strayed and Robert Atwan. --Interview: Denali National Park with Ranger Cassie Branst in which I discuss my 10 day stay in the East Fork Cabin, wildlife encounters, and writing.